In season 2 the quality of the show improves considerably. While there are still some slip-ups to mourn (I look at you, Go Fish! ), it also contains some episodes that in my opinion belong to the best of the whole show. It already starts with When She Was Bad that correlates directly not only with regards to content, but also quality wise with its fantastic predecessor Prophecy Girl. School Hard follows, Lie To Me, Bewitched, Bothered and Bewildered, I Only Have Eyes For You and the fantastic double features Surprise/Innocence and, of course, Becoming I and II. All of them are television at its best; but there’s one episode that really knocks it out of the park for me: Passion. Passion is a milestone. It’s the one episode where the audience gets hit with the fact that on this show, NO character is safe, not even those who are in the inner circle, and thus catapults the whole series on a whole new level of scary. And talking about scary – it’s this episode where Angelus really reveals for the first time how very much frightening he is. It’s not even his murder of Jenny that shows us who and what Angelus really is and what he’s capable of. It’s the subtlety with which he works on demoralizing Buffy, the way he uses his intimate knowledge to get to her – through those she loves most. (Willow’s fish in an envelope on her bed – eek!) Threatening the Slayerettes proves to be most effective and it’s not so much the murder of Jenny that crushes her, it’s what it does to Giles, and Angelus knows that. What Angelus didn’t anticipate though is the strength of the bond between the friends. It’s the threat against Willow that, instead of weakening her, works as a wake-up call. It’s right after that incident, in the company of Willow to keep her safe that she realizes how much of herself she gave away to Angel, captured by her first real love; admitting to her friend that her first instinct amidst everything happening still is to call Angel is the first step to take charge of her life again. 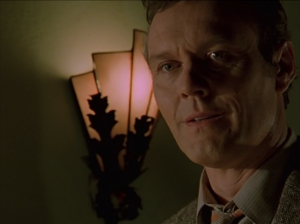 In this episode it gets unmistakably clear that what might have appeared kind of endearing to many viewers – the tendency to stalk Buffy from the moment he sees her, both before and after he met her and even after coming together (“I lurk…”) – is an inherent trait that Angelus always used to his advantage in his perverse mind games and is in fact even on Angel anything but endearing, but creepy and, considering where this habit comes from, downright scary. Passion perfectly follows through with the set up that started with Innocence, and turns out to be the episode were Buffy’s life truly takes a turn to the dramatic and changes forever. While after Innocence the hope still lingered that the loss of Angel’s soul could somehow be repaired or compensated, that there’s still something of Angel inside him that can be revived, it’s here, the moment when she hears of Jenny’s death, that Buffy realizes she has to stop him. It’s certainly one of the worst of her life, and Angel’s pleasure outside her window makes it so much worse. So much already happened in this episode until this moment, it would’ve been a fantastic one even if it ended right there. But it doesn’t. It gives us the incredible moment between Buffy and Giles on top that shows the decision Buffy made – for her loved ones. Once more, like before in Prophecy Girl, she actively decides to fight the good fight and accept her loss – for those she loves the most. It’s where her passion lies. But this time she doesn’t sacrifice her own feelings and desires; instead she finally begins to take some of her identity back, a process she will complete in Becoming II the moment she catches the sword. Giles acknowledges what she’s doing as what it is and how hard it is on her and reacts instantly, even though deeply grieving, with supporting her, which displays in letting her cling to him after saving him against his will and hitting him, thus accepting that she needs him, and later letting her even mourn together with him at Jenny’s grave. What started at the end of Innocence with him giving her his sympathy and respect instead of reproach and disapproval beautifully culminates here in their getting even closer than before. It’s here, I think, where Giles truly begins to grow into the role as a surrogate father. In trying to rip them apart, Angelus only managed to strengthen their bond. and then the subsequent phone call to Buffy and Willow. Especially this one is brilliantly shot, reminding of a very similar shot where Angel revealed to Buffy his old true self. This time, the veil it’s shot through separates them where before it had them appear like in an enclave – together against the world. This time, it’s her friend Buffy is together with. And then there’s the scene of Angelus hunting and murdering Jenny – truly terrific in writing, acting, lighting and filming, climaxing in the realization that it hasn't been an empty threat when Angelus said his ‘and teacher – makes – three’. Horror at its best. Additionally there's so much happening aside this main plot - Buffy kind of forgiving Jenny for the sake of Giles; Joyce having The Talk with Buffy; Spike and Angelus becoming more and more hostile toward each other; Willow picking up the teacher's role; the first mention of Xander’s Snoopy Dance - which all contribute to making this a brilliant episode. I love how significant the title of this episode is. It’s all about the risk of letting passion rule you and letting someone in, even if it’s someone you love, but “don’t know if I trust you” and the looming consequences if you’re making a mistake. But it’s beautifully balanced out with the positive consequences it can have if it’s the right one to trust. Even if Buffy has to let go of Angel, thanks to her friends she doesn’t have to live a life without passion - she doesn’t have to live a life where she’s emotionally dead. And this is what in the end gives her the strength to kill the man she loves - for the greater good, but first and foremost for her friends.